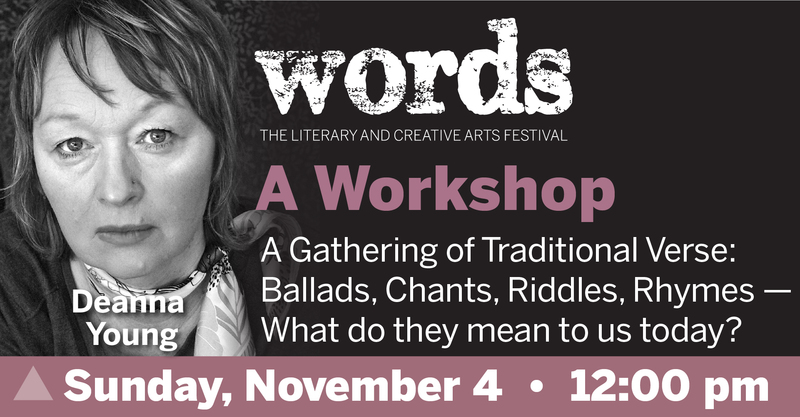 A Gathering of Traditional Verse: Ballads, Chants, Riddles, Rhymes—What do they mean to us today? If you were ever a child, you are likely familiar with traditional and populist forms of verse such as nursery rhymes, songs and prayers. Perhaps you have an Irish blessing shellacked and hung on your kitchen wall, or you recall wartime marching song, or a skipping chant from Grade 6. Most often, these forms are part of an oral tradition. What place do traditional poetic forms have in your life as an adult? Outside of popular music, what role do they play in wider contemporary culture? In my latest book of poetry, Reunion, there are a number of song-like, rhyming poems based on forms from the folk culture of my youth. The sounds and structures of these traditional forms had seeped into me, I realized, and become part of my voice as a writer. How have these forms affected you? For this workshop, bring—by pen or by rote—a short traditional poem in any form to share aloud with the group. Be prepared to tell us what it means to you. The workshop—rated PG, by the way—is depending on you for the raw material.